Pub in Whetstone, owned by the New Pub Company (who also own the Glasshouse in New Malden, among other pubs). The front part is dominated by the bar, and the feel is cosy rather than spacious, with a mixture of banquette seating, small half-round armchairs, a stool or two at the bar, and normal upright chairs. A fruit machine and flatscreen are here too. The bar has three handpumps, which are round the side and so not immediately apparent as you go in. Further back is at least one more room, with at least one more flatscreen. There's a beer garden out the back, which according to the reviews linked below is quite large and includes a covered seating area and some swings for children. When Kake visited in September 2010, all three handpumps were on, offering Sharp's Doom Bar (£1.70/half), Bombardier, and Young's Bitter. There were a handful of other people in when I arrived a little after 5pm. Service was friendly enough. Music was playing, somewhat inappropriately poppy/dancy for the time and mood. As of September 2010 food is served at least some lunchtimes and at least some evenings, but we're not sure of the exact days/times. 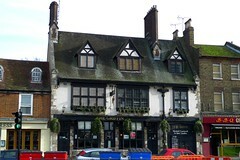 According to a board seen in September 2010, there's a quiz on Thursdays and live music between 9pm and 11pm on Saturdays. Accessibility: Fairly large step up to get in. Small step down to get into ladies'. Not sure about beer garden. Last edited 2017-02-05 19:14:27 (version 4; diff). List all versions. Page last edited 2017-02-05 19:14:27 (version 4).